It's not easy to upset Maruti. India's largest automotive manufacturer however now has cause for a headache and it's coming from as far south as it gets. 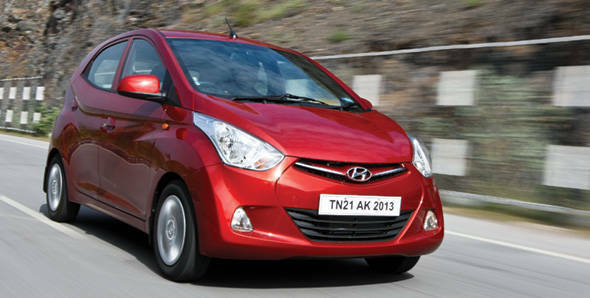 In the city of Chennai, Hyundai is busy plotting to inject a big migraine with their new Eon. It's aimed squarely at the Alto, India's largest selling car which has been in production for a decade. The Alto monopolised the segment that had only one competitor - the M800 - and despite its global evolution to the A-Star, Maruti decided to retain the Alto brand in India knowing just how successful the car is in their scheme of things. So the Hyundai Eon in India will target both the Alto and the A-Star, not to mention its very own stablemate, the Santro. The ground rules to play in this segment to date were just price and efficiency. Maruti literally wrote all the rules simply because there wasn't anyone to play against. They were the only kid in a sandbox. So elements like contemporary design, comfort, packaging, performance, dynamics and features were all left to their own devices, no one gave those aspects a second thought. And it's those areas that Hyundai is tapping into. Time to turn on the Eon. The Eon is the next embodiment of Hyundai's new design language and what we now know as fluidic design. It's funky and eye catching, and it's closely related, cosmetically, to the new Verna and the i10. You see the same profusion of lines and shapes especially at the front with those well defined cheekbones highlighting this car. The sunken grille with the chrome strip and the Hyundai logo embedded in the centre is another distinguishing character. Yet its most interesting feature are its wraparound headlamps and the beefy wheel arches. Viewed from a three quarter angle those clear lens headlamps with elaborately designed reflectors looked like giant Chinese soup spoons to me. But they are attractive and along with the rest of the elements adorning the Eon's face garner a lot of attention. The rear hatch area is also very attractively turned out complemented by the crescent moon shaped tail lamps. The hatch looks a bit small though access to the boot is easy and unrestricted. Overall the Eon appears to be a very busy pallet yet it has a smooth cohesive sense about it which makes it attractive. The Eon also has a very nice stance, contrary to Hyundai's tall boy designs in the past the Eon looks short and wide, hunkering down with a quiet confidence. It's less than 3.5 metres long and just a little over 1.5 metres wide with a 1.38-metre wide track and 170mm of ground clearance. It's compact and yet looks much larger than the Alto, in fact it almost looks as large as its sibling the i10. Ideally seeing just how large the Eon is for an entry level compact car should prepare you for the shock of its interior. This is by far the most spacious cabin in any entry level compact car. I could easily seat four of me and have space for one more mini-me. Do not expect it to be a full 5-seater, not without three people in the rear bench getting too intimate. What does happen is generous knee room for rear seat passengers with ample shoulder space. At the front it's a bit of a squeeze sideways, and the driver will always bang elbows with the passenger when trying to shift gears. Design wise this is an ergonomically sound cabin. It has the same sense of flair as we have come to see in the most contemporary Hyundais. The gentle crests and troughs keep it interesting and I like the small cap the upper layer of the dashboard forms over the centre stack. Even on bright sunny days the shadow it throws over the stereo panel will ensure clear readability. The controls for the air-con and the stereo are simple to use though I did think that the profusion of buttons on the stereo panel could have been trimmed down a bit. Nevertheless that centre stack is nicely designed with the entire dashboard cascading into that single area. The instrument console features a simple three pod layout, with a large speedometer placed in the centre and flanked by the temperature and fuel gauge on either side. The dials are clear and easy to read. A small window inside the speedo pod relays basic trip and odo readings and also indicates the correct gear to drive in. The interiors are also nicely styled with a two tone shade and bursts of faux aluminium inserts across the dashboard and the door pads making the interior feel rich. The cabin is also quite practical and apart from the generous amounts of space you also get several storage bins and bottle holders. There is also a very generous boot with 215 litres of storage space and the rear bench folds down to provide more if required. A USB port allows iPod connectivity, I'm not certain how well it operates but just in case it does not accept your device there is an aux port below it, so a solution is available. Fit and finish is very good, the shut lines are tight and look like they will stay that way for a long time. The doors close with a well meant thud, the seats are supportive despite looking pretty slim, there aren't any unfinished areas and I genuinely believe Hyundai has now fully understood low cost engineering allayed to high quality very well. The Eon is an all-new car from the ground up and sports an all-new platform. The hatchback is 3.49 metres long, with an overall width of 1.55 metres standing 1.5 metres tall. The monocoque with a front engine front wheel drive layout has been designed for comfort more than dynamics as well as to handle the myriad stresses it will be put through once it reaches all corners of India. The suspension at both ends is a mix of a MacPherson at the front and a torsion beam at the rear. It's tuned for the city and to provide optimal damping rather than hot hatch like handling. The ride while I wouldn't call it plush is surprisingly good for our conditions and the Eon's gas charged dampers, a first for this segment, work better than a hydraulic system. Where handling is concerned the Eon is competent in the city but there is a fair amount of body roll and understeer once you begin to explore her limits. I found it strange that the Eon has electrically assisted power steering only on the top four variants. On the lesser variants it's a standard manual steering without any assist. The electric system is a bit lifeless and I thought strangely enough heavy, though it's lighter and saves more space than a hydraulic system. And while it's perfectly fine for regular commutes within the city, it's not too communicative or precise if you start driving her enthusiastically. In comparison I'd say the Alto's steering does feel a bit lighter though it too is devoid of any feel. The Eon also very strangely offers 12-inch rims and wheels on the first three variants and 13-inch on the Magna upwards to the Sports. I would assume this is to offer better dynamics in the more expensive variants, but seriously who is really looking for dynamic abilities here. It would have been simpler to keep just one profile, preferably the 145/80 R12 rather than the 155/70 R13, standard among all the variants. The Eon does not offer ABS on any variants, has discs up front and drums at the rear. The Hyundai Eon in India gets a 3-cylinder engine that was developed at Hyundai's R&D centre in Hyderabad. It's the same engine as in the i10 with one cylinder removed to reduce displacement. It makes 56PS of max power along with 75Nm of torque which is the best in class. Driveability isn't great with max torque being generated at a fairly high 4000rpm which means you have to constantly shift down to lower gears. In urban areas you will find yourself using second and third gears constantly and that also keeps the revs high. At engine speeds above 3000rpm it sounds buzzy and scratchy and the sound only dies out considerably when you shift to higher gears and keep the revs low and that largely happens on the highway. Yet its NVH is within comfortable limits and unless revved hard this engine is a quiet operator. It's also very similar in feel to the Alto's 800cc engine, in first gear there is a small flat spot under 1500 rpm that intermittently also shows up in second gear. At times unless revved hard it feels like the engine is dying out even though you've engaged first gear and released the clutch. The 5-speed transmission is smooth to operate, however on another car it felt notchy. I guess these are some of the consistency issues that Hyundai will have to sort out. The ratios nonetheless are spaced out quite a bit to provide the best fuel efficiency rather than performance, yet first to third gears sees the Eon gain momentum quickly enough. With a kerb weight of 725kilos the Eon has a decent 77.24PS per tonne though with the tall ratios don't expect the Eon to make progress very fast. So 100kmph comes up in a lazy 19.08 seconds by which time you are also inching very close to the quarter mile mark, that's how much distance it covers to get to 100kmph. The quarter mile then takes another eight tenths of a second. With the strong low and mid range but just noise at the top the Eon feels slow in the roll-ons. Third gear overtaking acceleration is decently fast but shift into fourth or fifth and the 40-100kmph runs feel like an eternity has passed, both runs recording well over 25 seconds. The Eon is quicker than the Alto by a slim margin but at nearly two seconds, a margin it is. That said all of Hyundai's efforts have been put into fuel efficiency. According to the ARAI figures the Eon returns an overall of 21.1kmpl, on our test cycles however she returned 15.6kmpl in the city and on the highway a brilliant 24.3kmpl but the overall adds up to just 17.75kmpl which is much lesser than what Hyundai claims. Where comfort and convenience is concerned the Hyundai Eon in India offers variants at six different price points that are equipped accordingly. In the basic D-Lite trim (Rs 2.69 lakh. All prices ex-Delhi) for instance you get next to nothing other than a car with four doors, four seats and an engine. No air-con, no power steering, nothing. The D-Lite with air-con option comes for Rs.2.92 lakh. I was surprised that in the lower trim you don't even get the bottle holder in the door pads. Aren't door pads common across the range? The electric power steering option is available from the Era (Rs 3.11 lakh) upwards. The cream only starts appearing three variants up with the Magna (Rs 3.36 lakh). The Magna with optional package which includes a 2DIN system, USB and aux ports comes for Rs 3.46 lakh. As for safety I thought having just one airbag for the driver was a bit silly. And this is available only in the top variant the Sportz (Rs 3.71 lakh) which also features keyless entry and front fog lamps. Hyundai justifies the single air bag policy by saying this is not a family saloon or estate and they expect most owners to be single drivers without any passengers in the car most of the time. Hardly a justification. ABS also does not figure in any variant and I found that to be a bit disappointing.